C González-Pedraz, A V Pérez-Rodríguez, E Campos-Domínguez, M A Quintanilla Fisac (2017): “Comparative analysis of Spanish universities presence in national and local digital press”. Revista Latina de Comunicación Social, 72, pp. 861 to 882. Introduction. Dissemination is a cross-cutting activity within universities so the analysis of how media cover university news becomes a relevant issue in order to understand how public image of higher education institutions is being configured. Method. This work applies a mixed methodology, quantitative – content analysis - and qualitative - ethnographic study -, on a sample of 3137 news published between January and September 2016 in two digital newspapers of national scope and 13 regional / local scope newspapers, regarding 23 Spanish universities. Results and conclusions. The results suggest that media scope strongly influence the coverage. While national media carry out deeper analysis of news items, giving more visibility to university experts and including cyber-journalism resources; Regional and local newspapers are more dependent on calls and press releases from university press offices, they mainly report on university events and barely use cyber-journalism resources. Universities; cyber-journalism; science journalism; science communication; content analysis. 1.Introduction. 2. Objectives and method. 3. Results. 3.1. Comparative analysis regarding the journalistic approach. 3.2. Comparative analysis regarding universities activities. 3.3. Comparative analysis by topics.3.4. Comparative analysis regarding the use of cyber-journalism resources. 4. Conclusions and discussion. 5. Notas. 6. References. Thus, Spanish Law recognizes the crosscutting role of communication within universities tasks. Within diffusion activities are those addressed to the general public through the media, what Scott (1987) calls the mediatization of knowledge. In order to reach general public, Universities have their own communication offices in charge of awaking public awareness about teaching, research, scientific and cultural activities that take place in any of the University centres (...) especially in the case of public universities, as public communication is considered to be one of the accountability tools to society, available for higher education institutions" Garcia Rivas (2003: 29). So, providing relevant institutional information to the media, and managing the relationships with these actors are the main communication offices tasks (Castillo y Almansa, 2004; Alcoceba, 2010). From another perspective Kim et al. (2007) have analyzed how negative or unfavourable university's news published in local newspapers affect the public's perception of the institution. Through content analysis and a citizen’s survey, they were able to determined that greater exposure to these types of articles was related to low levels of reputation, lack of confidence and support to universities. Herrero-Solana et al. (2014) studied if a scientific production of a university impacts their presence in digital media, comparing bibliometric indicators with the number of institutional news items recovered from Google News, regarding nine Spanish Universities. They concluded that, effectively, that those universities with higher biblimetric indicators also reach greater media exposure. From a similar perspective, using a sample of 50.000 science news items, and 186.000 scientific papers, Perez-Rodriguez (2016) designed an indicator, called the visibility rate, which relates institutional scientific production with the impact of a particular research centre on science news. The author suggests that although there is a positive correlation between scientific production and media impact, this is not a direct one. There are other factors, such as journalist’s practices (newsworthiness criteria) that have greater influence than scientific production on an institution's media presence. Along literature´s review, it has been noticed a scarcity of papers focused on how media scope affects institutional impact on science news, despite constituting an interesting subject of study from two points of view: on the one hand, it is useful to know what kind of institutional image society receives depending on the scope of those media with greater diffusion among citizens; and on the other hand, it is relevant information for universities themselves and for their communication offices, as objective data are needed in order to better planning public communication strategies. Repiso et al. (2016) studied how Spanish universities resembles each other through their presence in the media. For that purpose, researchers analysed 128 printed journals with a nation, regional and local scope, where they found information on 81 public and private universities. The authors noted that media attention towards University news mainly depends on the geographical location of those institutions, being regional journals those which showed more interest on closer university news. However, no studies have been found comparing the coverage and journalistic treatment of universities in different media, focusing on aspects such as the type of information published, more frequent subjects, or what kind of university activities are become more visible depending media scope. The general objective of the current work is to develop a comparative analysis of the Spanish Universities presence on national, regional or local press focusing on digital editions of general media. Four specific objectives have also been considered: to deepen and compare the journalistic treatment of media with different scopes of higher education institutions, to determine which of the university's work areas reach greater visibility in the media, to estimate the impact of different scientific disciplines in national and local newspapers, and to know if the use of cyber-journalism resources varies according media scope. It is intended to answer the following research questions: Are there significant differences in the journalistic treatment of Spanish universities depending on the scope of the media? What university activities have a greater presence in national digital newspapers and which are more visible in local newspapers? What areas of knowledge are the ones that most interest national newspapers and which are the ones that demand the attention of the local media? Do national and local media equally use cyber-journalism resources? The study makes four hypotheses. The first is that the journalistic treatment of the universities in the national digital press is more profound, as these media have greater resources both human and material, compared to the local digital press. This should be reflected in aspects such as the genre of news items (more articles, interviews and opinion articles in national newspapers and more news and brief pieces on the local press), their authorship (mainly journalists and experts in National media and more agency information and press releases on the local newspapers) or their sources (various sources in the national media and more single source news items on the local press). The second hypothesis suggests that national media give greater visibility to the research results and university experts opinions, while the local media focus on press releases and events. Third, it is assumed that there are no appreciable differences regarding most interesting topics depending on the media scope. Finally, notable differences are expected in the use of cyber-journalistic resources - such as hypertext or multimedia elements - depending mainly on the size of the media. It is possible to document a more frequent use of cyber-journalism resources in the national media, as they have more advanced computer platforms and a more staff in their newsrooms. To test these hypotheses a mixed, quantitative and qualitative method has been designed. On the one hand, a content analysis of news items published in 15 digital newspapers, 2 of national scope and 13 of regional and / or local scope has been carried out. In order to build the news data base, the search systems of these media have been used, introducing key- words chains - in line with previous methodologies (Legerén Álvarez, 2014) - concerning the complete designations of 23 universities , in Spanish and also in the second official language of the region in which the institution is located, depending on the case. The digital newspapers included in the sample were those with greater diffusion according to the OJD (Office of Justification of Diffusion). As for the regional and local newspapers those with greater diffusion within the universities area were selected, except in certain cases . That team developed a codebook and a content analysis sheet that contained a battery of variables and responses, taking into account four dimensions that were aligned with the four specific objectives of the present study. In the first place, in order to monitor the journalist approach, variables such as section, author, gender and sources, applied in previous related studies were included (Fernández Muerza, 2005; Camacho Markina, 2009). Secondly, to determine which university activities are most visible, Frame Theory (Scheufele, 1999) was applied and six possible frameworks were established: The university presence in the context of a study or project of scientific, technological or innovative nature that has been developed inside the institution; university presence in a self-organized activity or event; a mere mention in a news item in which the university is not the main actor; a university expert assessment on a current issue or an editorial prepared by experts from the institution. Finally, an undefined frame category was also included. In addition, when the frame was a study or a research project, another variable was measured: if some type of collaboration was described in the news, as well as the scope of the study (regional, national, European or international). The objective has been to know what image of the university research activities and scientific collaborations is reflected in those media. Thirdly, the 26 areas defined by the ANEP (National Agency for Evaluation and Prospecting), as the state reference entity for the evaluation of the quality of the research , were used to define which topics or which fields of knowledge obtain greater coverage. Subsequently, the reliability of the codebook was tested by an inter-coder analysis in a random sample of 50 news items. This test was carried out from October 11th. to15 th. 2016. A satisfactory reliability coefficient (93%) was obtained according to Lombard et al. (2002) and, after detecting some shortcomings, the codebook was updated, formulating new answers for some of the variables. Alongside the coding work and in order to better understand some phenomena, a qualitative ethnographic study was developed. In a field notebook the study describes that information relevant for the analysis derived from indirect and unstructured observation, thus collecting facts and data that, due to its nature, could not be included in the quantitative analysis. This work was developed from October 1st. to November 30th, 2016 by the same coders, who recorded their observations in a word processor (* .word) housed in the cloud. Through this methodological triangulation (Arias Valencia, 2000; Rodríguez Ruiz, 2005), the research team have tried to obtain complementary findings. Before presenting the results it is necessary to take into account a number of general considerations. During searching tasks a large number of repeated news items printed in local or regional newspapers was found, some of them with different dates and even in different sections. In those cases, it was decided to include in the data base only the items that had been published in first place. In addition, publication time of those news - usually 00.00 or 01.00 a.m. -, registered in the field notebook, suggests that those items are included in the digital edition coming from the printed version, and it seems to be an automated procedure, that takes place on a daily basis. On the other hand, the limited number of news items located in some newspapers, such as La Vanguardia, suggests that some search engines do not adequately retrieve the information. Also, the fact that the items from newspaper supplements weren´t included may has influence the data base size, especially regarding some digital newspapers that have specific supplements for university news, such as Diario Córdoba and its UCOniversitas supplement . To study if there are significant differences in the journalistic treatment of Spanish universities according to the scope of the media, four variables were measured. Regarding the section, no significant differences were noticed depending on the scope of the newspaper. The comparative analysis of relative frequencies indicates, in line with previous observations, that university news are more commonly published in the newspaper 'Local' section. This happens in more than 40% of the analyzed news in the regional and local media as well as in the national newspapers. This fact draws particular attention since even the national media give university information a purely local perspective. Behind the 'Local' section are 'Economy', 'Opinion' and 'Culture' sections, in contrast to those which, a priori, may seem more propitious like 'Science', 'Health' or 'Technology'. Notable differences have been documented, regarding authorship. Although news authored by journalists are the most frequent, in both cases (65% of the total in the national press and 49% in the regional and local press), regional and local newspapers published a greater proportion of news items authored by 'Agencies' (22%) or the generic designation 'newsroom' (25%), compared to the national press, with an 8% and a 7% respectively. This results differ from those obtained in other studies (Sancha, 2005). Likewise, opinion articles signed by columnists are very scarce in the regional and local media (3%), while in national newspapers they represent a 20% of the published materials. There have also been significant differences in the journalist genre. 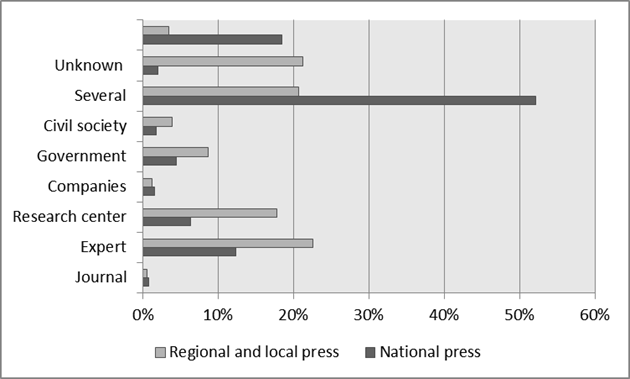 While almost half of the located news in national press is (48%), the predominant genre in regional and local press is the news (65%). 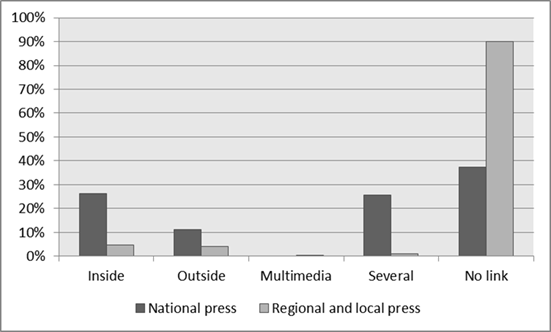 Likewise, there was no brief news in the national media, while in the regional and local newspapers they reach a 10%. The qualitative study indicates that brief news about research topics have been identified in the local media although considering the complexity of such matters they would have better fit to genres such as reportage, that provide more context and allow deeper analysis. As a curious practice it is worth mentioning that in El Diario de Jaén many brief news were located, referring to the printed edition, for the readers to complete the information. Consistent with the authorship data, only a 4% of the regional/local news items are opinion articles, compared to the 20% registered in the national press. Another noteworthy fact is the scarcity of interviews noticed in both types of media (2% and 4% respectively), despite being an apparently suitable genre for university information. The comparative analysis of the sources also shows great differences. In national press the most frequent professional practice is to cite several sources (52%). Only a 28% of the news cited a single source. As for opinion articles, the variable was coded as "not applicable" (18%). 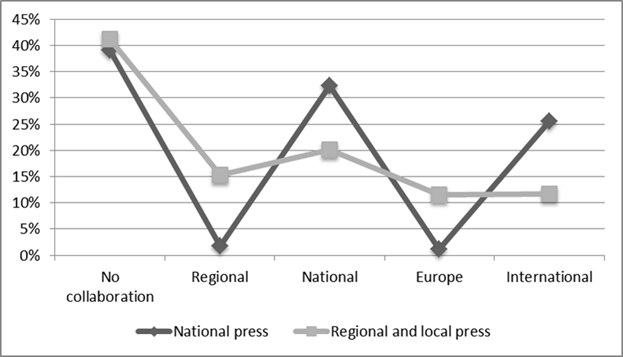 On the contrary, single source news are very frequent in regional and local press (56%), although it is an ethically unadvised practice (Loose and De Lima, 2012). It also highlights the fact that no source is cited in 21% of news items. The ethnographic study shows that those are institutional press releases sent to the media by universities communication offices. In both types of media, experts, research centres, government agencies, civil society entities, companies and academic journals are, in this order, the most common actors when a single source is cited. Six tasks frames were predefined in order to analyse which of the Universities activities reach greater presence in national digital newspapers and which more frequently attract digital local press attention. The first frame coded University presence in news that were focused on expert’s evaluation on current matters; the second one, frames institutional presence in those news covering events organized by universities themselves. On the other hand, university presence in opinion articles was, again, clearly superior in national press. On the contrary, the relative presence frequencies were similar in news presenting a study or a project of a scientific, technological or innovative nature. While this last frame was registered, it was also coded by the technical team a variable that shows if some kind of scientific collaboration was mentioned on the news item, what was its nature, or what kind of actors it involved. Universities appear as a sole institutional actor in 40% of the data base, regardless the media scope. Some differences appeared in the news where some kind of scientific collaboration was mentioned. In National press, a 32% of the identified cases addressed collaboration between national partners while a 26% focused on international scientific cooperation. From that international partnerships just 1% refers to a European-wide collaboration, which is noteworthy given that Spain accounts for 9.7% Horizon 2020 research program funding, as reflected in the COTEC 2016 Report. 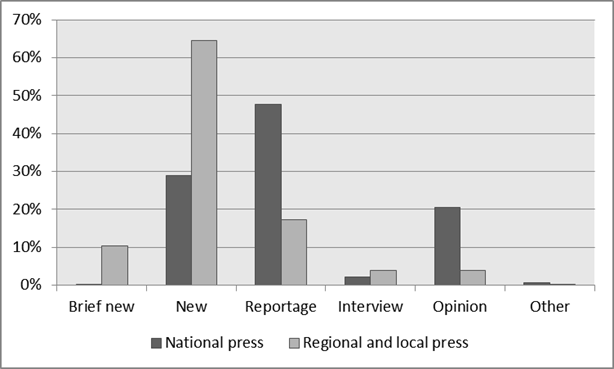 In regional and local press, the percentages related to the scope of the collaboration are fairly balanced, with national partnerships (20%) being the most frequent, followed by regional cooperation with a (15%), in keeping with the journalistic criterion that highlights those facts that are geographically closer to the reader. Turning to the third research question, about which scientific areas are more interesting for national newspapers and which claim the attention of local media, the results indicate that, the Social Sciences (22%) -including disciplines such as Political Science and Administration, Communication or Sociology-, History and Art (11%) and Economics (10%) are more likely printed in national press. These results could be related to the fact that expert evaluations on political, social and economic issues are one of the most common frames for university presence in the national newspapers. Although in the reverse order, the most common topics in university news at a regional and local level are again History and Art (13%) and Social Sciences (11%). Then, the percentages among topics are fairly balanced, although Health - Clinical Medicine (8%), Biomedicine (6%) and Fundamental and Systems Biology (1%) topics arouse greater interest. 15%), as suggested by other studies (Martín and Ponce, 2012; Ruiz Jiménez et al., 2014). The nature of the topic itself, of general interest, explains that it calls media attention. It is remarkable in both cases the good data recorded by History and Art topics. A fact with no clear explanation so further studies would be needed to properly understand it. The qualitative study gathers some relevant facts in relation to specific topics, such as Mathematics. The percentage of articles related to this area is higher in the national press due to permanent sections in national newspapers such as Coffee and Theorems in El País. Finally, an attempt has been made to answer the question of whether or not the digital media use cyber-journalism resources. The results reveal a very limited use multimedia resources. As previous studies revealed (Martín y Ponce, 2012), digital newspapers, as well as printed press, mostly illustrate their articles with photographs, which evidences a low multimedia resources implementation, even in big newsrooms. Nor the use of photo galleries, containing images from the same topic, is a frequent resource. Although the use of multimedia resources is very scarce in both types of media, national scope newspapers seems to be slightly more prone to the implementation of new elements to the news other than photographs. One in every 10 news in national media already incorporates multimedia resources, a percentage that is reduced to 2% in the case of regional and local media. In the latter, it is noteworthy that 35% of the analyzed newspaper articles are not accompanied by any type of element, that in general the use of computer graphics is practically non-existent, and that no audio has been located, suggesting a remarkable underutilization of the digital tools, although being this elements one of the main values of cybermedia in relation to scientific information (Byrne et al., 2002, Rodrígues Pereira et al., 2014). In relation to hyper-text features, there are substantial differences depending on the media scope. In one of every four national news there is a possibility of macro-navigation - linking to other external websites - and of micro-navigation - linking to other pages from the same medium (Díaz Noci and Salaverría, 2003). On the other hand micro-navigation predominates (26%) over macro-navigation (11%) in those articles that only shows one type of hypertext feature. However, a high proportion of articles (37%) do not include any type of link, indicating that progresses in this regard are still needed. This percentage rises to 90% in regional and local newspapers, a fact that reveals how smallest digital media are undeveloped in terms of hypertextual reading possibilities, in consonance with other studies results (Bell, 2012, Martín and Ponce, 2012). According to the qualitative study, this may be due to the fact that the news published in the printed edition are automatically uploaded to the digital version without adding hyper-textual elements, as suggested by the fact that the publication time of this news items in the local media is coincident. The permanent content update is another cybermedia fundamental feature. This has entailed the establishment of permanent newsrooms, active 24 hours a day, and the need to first publish current information to get ahead of competitors (Dunwoody, 2014). The obtained results clearly illustrate this trend, with no significant differences depending on the media scope. The information is updated throughout the day, as shown by the lines in the following chart. The qualitative study shows that some news items and the whole group of articles recovered from El Diario de Jaén and El Periódico de Aragón do not indicate publication time, which means that is not possible to establish the updating status for a 33.26% of the regional and local data base. 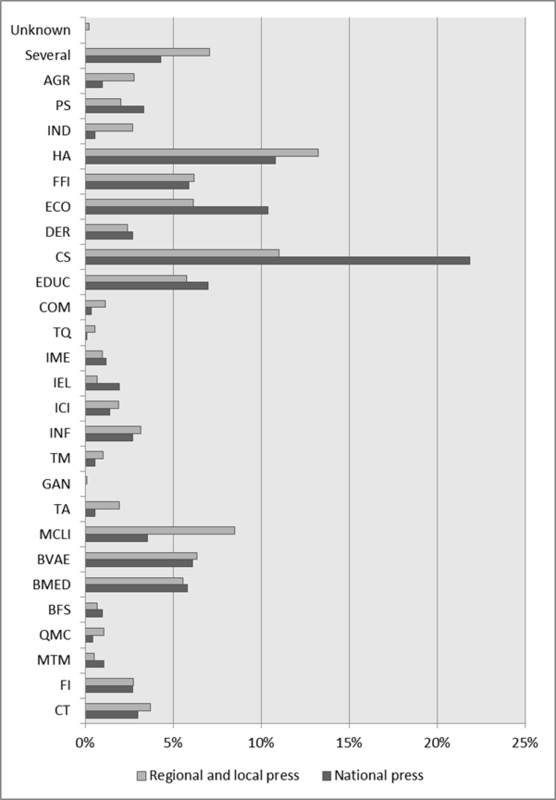 The number of comments received in each journal article was counted in order to study interactivity. This interaction was selected as one of the tools that contribute to create a participatory and dialogic environment in the online media, allowing the reader to be more than a simple consumer of information (Montgomery, 2009). This is particullary important in science news as it helps saving the traditionally perceived gap between scientists and lay people (Thorsen, 2013). There are important differences between the analyzed newspapers. While the national cope media counted a total of 33073 comments (an average of 35.44 comments per article), the regional and local media registered 1142 (an average of 0.51 comments per item). This seems to be due to the logic that a greater number of readers write a greater number of comments. However, it is striking that regional and local newspapers, those that publish news regarding reader’s closest environment and therefore, that may more directly impact people's daily life, do not even received one comment per article. In spite of the interaction possibilities readers don´t show much interest and in practice they are not exploiting these possibilities. In addition, the qualitative analysis documents that a 0.43% of national media news, and a 3.94% of regional and local items did not allow comments. The ethnographic analysis indicates that, the percentage registered in national scope media is related to some items published in El País, mainly in the opinion section. This work suggests that media scope is a key element in University news coverage, and therefore, in the configuration of higher education institutions' public image. Citizens news consumption habits will affect their knowledge and opinions about Universities roles and performances. The unequal access to human and material resources observed between national scope media and to regional and local newspapers clearly arise during the analysis and directly affects university news coverage, as predicted by the first working hypothesis. National media, with greater resources, provide a deeper and more professional coverage as shows the fact that an 85% of the items are authored by journalists or columnists, that the predominant genre is the report, that one of every 5 signed news is an opinion article or that multiple sources are usually cited per article. On the other hand, regional and local media, with much limited resources, carry out a more extensive coverage in terms of quantity, but a more superficial one as they mainly dependent on press releases and calls issued by university press offices. This emerge from the fact that the proportion of news authored by journalists (49%) is practically equal to the sum of agencies items plus 'generically authored' articles (they are signed as newsroom articles) (47%), the common use of brief genre, the predominance of single source news or the fact that the main framing for university information is events coverage. The results suggest that university press offices are consciously or unconsciously guiding regional and local university coverage. On the contrary, the possibilities of institutional control in the national press are very scarce, since in these media journalists yet seem to be carrying out their traditional functions - gatekeepping, presenting different stakeholders points of view, surveillance, locating multiple sources, etc. (Hayes et al., 2007), so that the presence of the university in these media is directly related to journalists routine of accessing academics as expert sources (55%). The second hypothesis, has only been partially proven, since it has been verified that regional and local media do cover a wider range of events and that national media provide greater visibility to expert’s knowledge, but not that university research has a predominant place in national press. Even regional and local newspapers perform a greater coverage of this type of issues (24%) than national media (18%). In the same vein, it is possible to conclude that the coverage provided by both types of media is picturing university research as a scarcely internationalized and non collaborative activity. In spite of this, the Strategy for the Internationalization of Spanish Universities 20015-2020 does not considered among its operational objectives the strategic importance of communication . The third working hypothesis, which presupposes the absence of appreciable differences in relation to the most interesting topics for both types of media, has been contrasted in the empirical study. Political, economical and social issues are the most frequent topics in university coverage and, beyond that, History and Art topics and those related to Health are the forth and the fifth topics more frequently covered both by national and regional/local newspapers. Finally, the fourth and final working hypothesis predicted notable differences in the use of cyber-journalism resources in terms of media scope. This hypothesis has almost been entirely proven, since bigger national newspapers, with greater technical and human resources, have made significant advances in relation to news hypertextuality, updating and interactivity. On the other hand, regional and local newspapers only seem to have only implemented permanent news updating as a digital journalism practice. In relation to multimedia feature, it can be concluded that it is the pending issue for both types of media. This cyber-journalism dimension presents little progress and is undoubtedly a future challenge, especially in university news coverage. In spite of the fact that the web environment allows content multimedia treatment combining text, images, graphics, video and audio (Hermida, 2007), there has not yet been an evolution in media coverage and professional practices in this regard remain the same as for traditional press. Although the utilization of those resources would facilitate public understanding of science news (Byrne et al., 2002). Both digital media and institutional press offices need to make greater efforts in the future, producing attractive content in adapted to different formats, platforms, and devices, in line with current trends (Canavilhas, 2013). In spite of the useful results, it would be opportune to carry out further studies in the future, expanding both the number of universities and newspapers analyzed, in order to obtain more conclusive data and to monitor the evolution of universities public image over time. It would also be interesting to apply this comparative approach to the broadcasting context, in order to test whether the results obtained in terms of university presence and digital press coverage in national and regional / local media are extrapolated to national and regional / local television or radio stations. This would allow to know what kind of universities' public image is being broadcasted in national, regional and local TV channels and radio stations, helping universities press offices to design their communication policies based on objective indicators. This study was developed under the FCT-15-10271 project, funded by the Spanish Foundation for Science and Technology (FECYT) through the Public Call for the Assistance in the Promotion of Science culture, Technology and Innovation 2015. The 23 Spanish universities included in the study correspond to those that voluntarily gave their consent to be monitored within the project FCT-15-10271 entitled Impact of UCC + i on the public visibility of Spanish Science: digital press and Twitter. The variability in the information search systems of the different newspapers has prevented the inclusion of some of these means, in particular those that did not allow searches with the criteria described in the methodology, so they have been replaced by the following newspapers with greater diffusion According to the OJD. For example, it was programmed the search of information in the Diari of Tarragona and in the Diari of Girona but, due to the difficulties found in their search engines, they were replaced by La Vanguardia. In order to avoid possible biases the research team agreed not to include news items from journal supplements or isolated references to universities in biographical news, political and economic conflicts, appointments, events, court proceedings and sports results of university clubs. Alcoceba Hernando, J. A. (2010). “Analysis of Institutonal Press Releases and its Visibility in the Press”. Revista Latina de Comunicación Social, (65), 354-367. Arias Valencia, M. M. (2000). “La triangulación metodológica: sus principios, alcances y limitaciones”. Investigación y educación en enfermería, 18(1), 13-26. Byrne, P. F., Namuth, D. M., Harrington, J., Ward, S. M., Lee, D. J., y Hain, P. (2002). “Increasing public understanding of transgenic crops through the World Wide Web”. Public Understanding of Science, 11(3), 293-304. Camacho Markina, I. (2009). Swuine Flu ("A"), in the Spanish Press. Revista Latina de Comunicación Social, 64, 827-843. Castillo Esparcía, A., y Almansa Martínez, A. (2004). “Estudio sobre la estructura y el funcionamiento de los gabinetes de comunicación en España”. Anagramas Rumbos y Sentidos de la Comunicación, 2(4), 47-62. Díaz Noci, J., y Salaverría, R. (2003). Manual de redacción ciberperiodística. Barcelona: Ariel. Dunwoody, S. (2014). “Science journalism: prospects in the digital age”. En: Bucchi, M., y Trench, B. (Eds.). Routledge Handbook of Public Communication of Science and Technology. Routledge. 27-39. Fernández Muerza, Á. (205). “La información científica en la prensa de referencia: el caso español a partir de un análisis comparativo”. Zer-Revista de Estudios de Comunicación, 10(19). García-Rivas, M. I. (2003). “Presente de la información institucional de la Universidad española. El caso de la Universidad de Murcia”. Comunicación y sociedad. 2003, vol. XVI, núm.1, p.29-56. Hayes, A. S., Singer, J. B., y Ceppos, J. (2007). “Shifting roles, enduring values: The credible journalist in a digital age”. Journal of Mass Media Ethics, 22(4), 262-279. Jianbin, J. I. N. (2006). “Presented image of universities in mass media”. Journal of International Communication, 2, 004. Kim, S. H., Carvalho, J.P. y Cooksey, C.E. (2007). “Exploring the effects of negative publicity: News coverage and public perceptions of a university”. Public Relations Review, 33 (2), pp. 233-235. http://dx.doi.org/10.1016/j.pubrev.2007.02.018. Legerén-Álvarez, E. (2014). Visibilidad de las universidades andaluzas en los medios de comunicación on-line a través de Google News (Tesis Doctoral). Universidad de Granada. Lombard, M., Snyder‐Duch, J., y Bracken, C. C. (2002). “Content analysis in mass communication: Assessment and reporting of intercoder reliability”. Human communication research, 28(4), 587-604. Loose, E. B., y de Lima, M. R. D. V. (2013). “A ciência nos portais de notícias: notas para pensar a popularização científica a partir do jornalismo online.Animus”. Revista Interamericana de Comunicação Midiática, 12 (23), 85-102. Thomas, J., Smidt, S., Scanlon, E., y Whitelegg, L. (Eds.). Practising science communication in the information age: Theorising professional practices. Oxford University Press. 83-97. Pérez-Rodríguez, A. V. (2016). Imagen visible de la ciencia en la prensa digital generalista: actores y procesos (España 2002-2011). (Tesis Doctoral). Universidad de Salamanca. Pérez Serrano, M. G. (1984). Un análisis de contenido de la prensa: la imagen de la Universidad a Distancia. Universidad Nacional de Educación a Distancia, UNED. Quintanilla Fisac, M. Á., Montero Becerra, A., Ochoa Henao, M., Orellana McBride, A. E., y Sabbatini, M. (2004). “Análisis del impacto de la actividad científica y tecnológica de las universidades españolas en los medios de comunicación”. Informe de resultados. Repiso, R., Merino-Arribas, A., Y Chaparro-Domínguez, M. Á. (2016). Agrupación de las universidades españolas en la prensa impresa nacional. Revista Española de Documentación Científica, 39(2), 131. Rodríguez Ruiz, Ó. (2005). “La triangulación como estrategia de investigación en ciencias sociales”. Revista Madri+d, 31. Rowe, D. y Brass, K. (2008). “The uses of academic knowledge: the university in the media”. Media, Culture & Society, 30 (5), pp. 677-698. http://dx.doi.org/10.1177/0163443708094015. Scheufele, D. A. (1999). “Framing as a theory of media effects”. Journal of communication, 49(1), 103-122. Scott, P. (1987). “Los receptores finales de la información científica y universitaria”. En Universidad y medios de comunicación. Madrid: Centro de Universidades, pp. 129-132. Papers relacionados FJ Paniagua Rojano, M Gómez Aguilar, ME González Cortés (2014): “Incentivar el emprendimiento periodístico desde la Universidad”. Revista Latina de Comunicación Social, 69, pp. 548 a 570. MJ Pérez-Serrano, D Rodríguez-Barba, M Rodríguez-Pallares (2015): “Mercado de la Comunicación y estudiantes de Periodismo. Estructura de la demanda de perfiles profesionales”. Revista Latina de Comunicación Social, 70, pp. 209 a 229. Article received on 8 June 2017. Accepted on 20 July. Published on 25 July 2017.